The first violin part for Beethoven's Symphony No. 6 in F major, Op. 68 – also known as the Pastoral Symphony – has been edited by Ilya Kaler, who has appeared as guest concertmaster with the San Francisco Symphony, Philadelphia Orchestra and Baltimore Symphony. Kaler's bowings, fingerings and other editorial markings have been added throughout the score. Allegro ma non troppo, "Awakening of cheerful feelings upon arrival in the countryside"
Andante molto mosso, "Szene am Bach "Scene by the brook"
Allegro, "Merry gathering of country folk"
Allegretto, "Shepherd's song; cheerful and thankful feelings after the storm"
The Pastoral Symphony begins with a placid and cheerful movement in sonata form depicting the composer's feelings as he arrives in the country, building orchestral texture via multiple repetitions of very short motifs which convey the "the infinite repetition of pattern in nature." The second movement "Scene by the brook" contains a motif imitating flowing water. The third movement is a scherzo in 3/4 time, depicting country folk dancing and reveling. It returns to the main key of F major but ends on an imperfect cadence that leads straight into the stormy fourth movement in F minor. F major returns in the finale, a 6/8 sonata rondo that represents the shepherds' song of thanksgiving. Download and print the score today to gain access to expertly edited Beethoven Pastoral Symphony No. 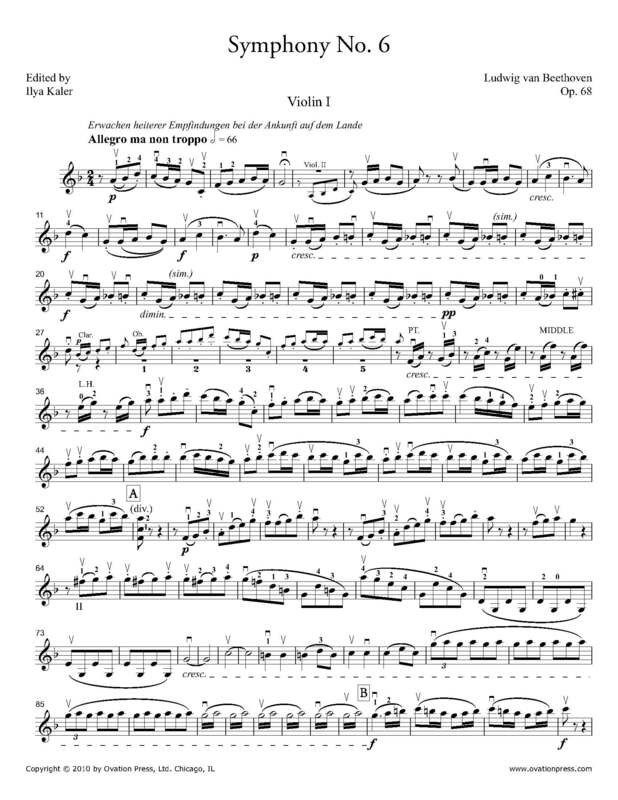 6 violin fingerings and bowings from Ilya Kaler!